Described as a grand hotel in miniature, The Capital was one of London’s first boutique hotels and has been welcoming guests since 1971.The Capital is a charming 5 Star Boutique Hotel on Basil Street just steps away from Harrods and at the heart of one of London’s smartest destinations for shopping, dining and culture alike. On the doorstep is Knightsbridge	, Sloane Street, Hyde Park, Kensington	, the National History Museum	and the world acclaimed V&A museum	. The Piccadilly underground station is 1 minute away linking up Heathrow Airport (LHR) and St Pancras International for the Eurostar. Buckingham Palace	, The Royal Albert Hall	, Green Park are all an enjoyable walk away. The hotel is one of the last luxury hotels in London offering a true sense of place; English interiors and very personal service. Our bedrooms accommodation in London	are all individual, English wall paper, antique furnishings, the families own paintings and many personal details. Arguably the UK’s best seafood chef, Nathan Outlaw has his only London seafood restaurant	here, Michelin starred Outlaw’s at the Capital. At the Capital we understand that each event is different – timings, food, layout, costs and fine details. 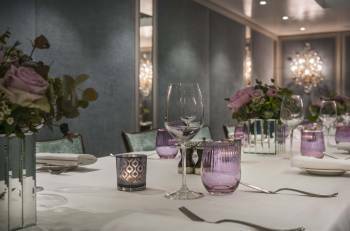 Our private dining rooms are the perfect venue for hosting a meeting or entertaining friends and family in London.Our dedicated team will work with you to ensure that guests attending private functions and events at this 5 star Knightsbridge hotel will enjoy the highest standards of service, all our dishes are prepared by the Michelin starred team from Outlaw’s at The Capital and on-site car parking is available by prior arrangement.